SENIOR WHITE HOUSE adviser Jared Kushner has denied that US President Donald Trump’s campaign colluded with Russia. In a statement released ahead of congressional interviews, he said he has “nothing to hide”. The 11-page statement given to the Associated Press today details four contacts with Russians during Trump’s campaign and transition. Kushner plans to deliver the statement during closed-door meetings with investigators on Senate and House committees this week. “I did not collude, nor know of anyone else in the campaign who colluded, with any foreign government,” Kushner said in the statement. He also insists that none of the contact was improper and denies that Russians finance any of his businesses in the private sector. 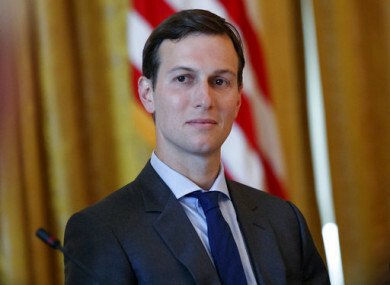 In speaking to Congress, Kushner — as both the president’s son-in-law and a trusted senior adviser during the campaign and inside the White House — becomes the first member of the president’s inner circle to face questions from government officials as they probe Russian meddling in the 2016 election and possible links to the Trump campaign. Kushner is to meet with staff on the Senate intelligence committee today and lawmakers on the House intelligence committee tomorrow. His appearance has been highly anticipated, in part because of a series of headlines in recent months about his interactions with Russians. The reticent Kushner had until today not personally responded to questions about an incomplete security clearance form and his conversations with foreigners. “I am not a person who has sought the spotlight,” he said in his statement. In it, he detailed a June 2016 meeting with a Russian-American lawyer and says it was such a “waste of time” that he asked his assistant to call him out of the gathering. Emails released this month show that the president’s son, Donald Trump Jr, accepted the meeting at Trump Tower with the idea that he would receive damaging information about Hillary Clinton. But Kushner says he hadn’t seen those emails until recently shown them by his lawyers. Kushner said in his statement that Trump Jr invited him to the meeting. He says he arrived late and when he heard the lawyer discussing the issue of adoptions, he texted his assistant to call him out. Kushner also denies reports he discussed setting up a secret back-channel with the Russian ambassador to the US. He said he did speak with the Russian ambassador, Sergey Kislyak, in December at Trump Tower. But he says that conversation was about policy in Syria. Kushner says that when Kislyak asked if there was a secure line for him to provide information on Syria from what Kislyak called his “generals”, Kushner asked if there was an existing communications channel at the embassy that could be used. Kushner says he never proposed an ongoing secret form of communication. Kushner also explained that his application form for security clearance was submitted prematurely due to a miscommunication with his assistant, who had erroneously believed the document was complete. He said he mistakenly omitted all of his foreign contacts, not just his meetings with Russians, and has worked in the last six months with the FBI to correct the record. Trump Jr and Trump’s former campaign manager Paul Manafort, who was also at the June 2016 meeting, were scheduled to testify before the Senate Judiciary Committee this week. However, on Friday their attorneys said they remained in negotiations with that panel. The two men are now in discussions to be privately interviewed by staff or lawmakers. The GOP chairman of the committee, Iowa Senator Chuck Grassley, has said they will eventually testify in public. Email “Jared Kushner says he has 'nothing to hide' about Russia ”. Feedback on “Jared Kushner says he has 'nothing to hide' about Russia ”.